Mohandas Karamchand Gandhi was the preeminent leader of Indian independence movement in British-ruled India. Employing nonviolent civil disobedience, Gandhi led India to independence and inspired movements for civil rights and freedom across the world. The honorific Mahatma applied to him first in 1914 in South Africa, is now used worldwide. He is also called Bapu in India. 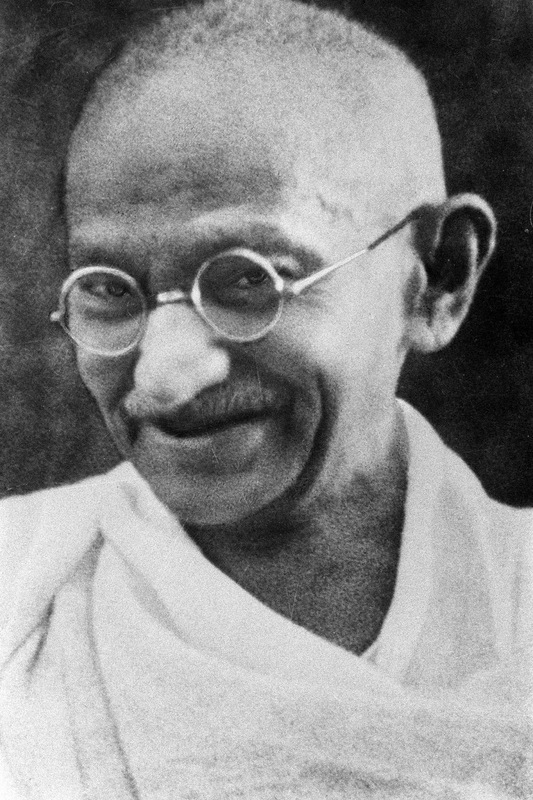 Born and raised in a Hindu merchant caste family in coastal Gujarat, western India, and trained in law at the Inner Temple, London, Gandhi first employed nonviolent civil disobedience as an expatriate lawyer in South Africa, in the resident Indian community's struggle for civil rights. After his return to India in 1915, he set about organising peasants, farmers, and urban labourers to protest against excessive land-tax and discrimination. Assuming leadership of the Indian National Congress in 1921, Gandhi led nationwide campaigns for easing poverty, expanding women's rights, building religious and ethnic amity, ending untouchability, but above all for achieving Swaraj or self-rule. Gandhi famously led Indians in challenging the British-imposed salt tax with the 400 km (250 mi) Dandi Salt March in 1930, and later in calling for the British to Quit India in 1942. He was imprisoned for many years, upon many occasions, in both South Africa and India. Gandhi attempted to practise nonviolence and truth in all situations, and advocated that others do the same. He lived modestly in a self-sufficient residential community and wore the traditional Indian dhoti and shawl, woven with yarn hand spun on a charkha. He ate simple vegetarian food, and also undertook long fasts as a means to both self-purification and social protest. Gandhi's vision of a free India based on religious pluralism, however, was challenged in the early 1940s by a new Muslim nationalism which was demanding a separate Muslim homeland carved out of India. Eventually, in August 1947, Britain granted independence, but the British Indian Empire was partitioned into two dominions, a Hindu-majority India and Muslim Pakistan. As many displaced Hindus, Muslims, and Sikhs made their way to their new lands, religious violence broke out, especially in the Punjab and Bengal. Eschewing the official celebration of independence in Delhi, Gandhi visited the affected areas, attempting to provide solace. In the months following, he undertook several fasts unto death to promote religious harmony. The last of these, undertaken on 12 January 1948 at age 78, also had the indirect goal of pressuring India to pay out some cash assets owed to Pakistan. Some Indians thought Gandhi was too accommodating. Nathuram Godse, a Hindu nationalist, assassinated Gandhi on 30 January 1948 by firing three bullets into his chest at point-blank range. Indians widely describe Gandhi as the father of the nation. His birthday, 2 October, is commemorated as Gandhi Jayanti, a national holiday, and world-wide as the International Day of Nonviolence. Mohandas Karamchand Gandhi was born on 2 October 1869 to a Hindu Modh Baniya family in Porbandar (also known as Sudamapuri), a coastal town on the Kathiawar Peninsula and then part of the small princely state of Porbandar in the Kathiawar Agency of the Indian Empire. His father, Karamchand Uttamchand Gandhi (1822–1885), served as the diwan (chief minister) of Porbandar state. The Gandhi family originated from the village of Kutiana in what was then Junagadh State. In the late 17th or early 18th century, one Lalji Gandhi moved to Porbandar and entered the service of its ruler, the Rana. Successive generations of the family served as civil servants in the state administration before Uttamchand, Mohandas's grandfather, became diwan in the early 19th century under the then Rana of Porbandar, Khimojiraji. In 1831, Rana Khimojiraji died suddenly and was succeeded by his 12-year-old only son, Vikmatji. As a result, Rana Khimojirajji's widow, Rani Rupaliba, became Regent for her son. She soon fell out with Uttamchand and forced him to return to his ancestral village in Junagadh. While in Junagadh, Uttamchand appeared before its Nawab and saluted him with his left hand instead of his right, replying that his right hand was pledged to Porbandar's service. In 1841, Vikmatji assumed the throne and reinstated Uttamchand as his diwan. In 1847, Rana Vikmatji appointed Uttamchand's son, Karamchand, as diwan after disagreeing with Uttamchand over the state's maintenance of a British garrison. Although he only had an elementary education and had previously been a clerk in the state administration, Karamchand proved a capable chief minister. During his tenure, Karamchand married four times. His first two wives died young, after each had given birth to a daughter, and his third marriage was childless. In 1857, Karamchand sought his third wife's permission to remarry; that year, he married Putlibai (1844–1891), who also came from Junagadh, and was from a Pranami Vaishnava family. Karamchand and Putlibai had three children over the ensuing decade, a son, Laxmidas (c. 1860 – March 1914), a daughter, Raliatbehn (1862–1960) and another son, Karsandas (c. 1866–1913). On 2 October 1869, Putlibai gave birth to her last child, Mohandas, in a dark, windowless ground-floor room of the Gandhi family residence in Porbandar city. As a child, Gandhi was described by his sister Raliat as "restless as mercury...either playing or roaming about. One of his favourite pastimes was twisting dogs' ears. "The Indian classics, especially the stories of Shravana and king Harishchandra, had a great impact on Gandhi in his childhood. In his autobiography, he admits that they left an indelible impression on his mind. He writes: "It haunted me and I must have acted Harishchandra to myself times without number." Gandhi's early self-identification with truth and love as supreme values is traceable to these epic characters. The family's religious background was eclectic. Gandhi's father was Hindu and his mother was from a Pranami Vaishnava family. Religious figures were frequent visitors to the home. Gandhi was deeply influenced by his mother Putlibai, an extremely pious lady who "would not think of taking her meals without her daily prayers...she would take the hardest vows and keep them without flinching. To keep two or three consecutive fasts was nothing to her." In the year of Mohandas's birth, Rana Vikmatji was exiled, stripped of direct administrative power and demoted in rank by the British political agent, after having ordered the brutal executions of a slave and an Arab bodyguard. Possibly as a result, in 1874 Karamchand left Porbandar for the smaller state of Rajkot, where he became a counsellor to its ruler, the Thakur Sahib; though Rajkot was a less prestigious state than Porbandar, the British regional political agency was located there, which gave the state's diwan a measure of security. In 1876, Karamchand became diwan of Rajkot and was succeeded as diwan of Porbandar by his brother Tulsidas. His family then rejoined him in Rajkot. On 21 January 1879, Mohandas entered the local taluk (district) school in Rajkot, not far from his home. At school, he was taught the rudiments of arithmetic, history, the Gujarati language and geography. Despite being only an average student in his year there, in October 1880 he sat the entrance examinations for Kathiawar High School, also in Rajkot. He passed the examinations with a creditable average of 64 percent and was enrolled the following year. During his years at the high school, Mohandas intensively studied the English language for the first time, along with continuing his lessons in arithmetic, Gujarati, history and geography. His attendance and marks remained mediocre to average, possibly due to Karamchand falling ill in 1882 and Mohandas spending more time at home as a result. Gandhi shone neither in the classroom nor on the playing field. One of the terminal reports rated him as "good at English, fair in Arithmetic and weak in Geography; conduct very good, bad handwriting". While at high school, Mohandas came into contact with students of other castes and faiths, including several Parsis and Muslims. A Muslim friend of his elder brother Karsandas, named Sheikh Mehtab, befriended Mohandas and encouraged the strictly vegetarian boy to try eating meat to improve his stamina. He also took Mohandas to a brothel one day, though Mohandas "was struck blind and dumb in this den of vice," rebuffed the prostitutes' advances and was promptly sent out of the brothel. As experimenting with meat-eating and carnal pleasures only brought Mohandas mental anguish, he abandoned both and the company of Mehtab, though they would maintain their association for many years afterwards. In May 1883, the 13-year-old Mohandas was married to 14-year-old Kasturbai Makhanji Kapadia (her first name was usually shortened to "Kasturba", and affectionately to "Ba") in an arranged child marriage, according to the custom of the region. In the process, he lost a year at school. Recalling the day of their marriage, he once said, "As we didn't know much about marriage, for us it meant only wearing new clothes, eating sweets and playing with relatives." However, as was prevailing tradition, the adolescent bride was to spend much time at her parents' house, and away from her husband. Writing many years later, Mohandas described with regret the lustful feelings he felt for his young bride, "even at school I used to think of her, and the thought of nightfall and our subsequent meeting was ever haunting me." In late 1885, Karamchand died, on a night when Mohandas had just left his father to sleep with his wife, despite the fact she was pregnant. The couple's first child was born shortly after, but survived only a few days. The double tragedy haunted Mohandas throughout his life, "the shame, to which I have referred in a foregoing chapter, was this of my carnal desire even at the critical hour of my father's death, which demanded wakeful service. It is a blot I have never been able to efface or forget...I was weighed and found unpardonably wanting because my mind was at the same moment in the grip of lust. Mohandas and Kasturba had four more children, all sons: Harilal, born in 1888; Manilal, born in 1892; Ramdas, born in 1897; and Devdas, born in 1900. In November 1887, he sat the regional matriculation exams in Ahmedabad, writing exams in arithmetic, history, geography, natural science, English and Gujarati. He passed with an overall average of 40 percent, ranking 404th of 823 successful matriculates. In January 1888, he enrolled at Samaldas College in Bhavnagar State, then the sole degree-granting institution of higher education in the region. During his first and only term there, he suffered from headaches and strong feelings of homesickness, did very poorly in his exams in April and withdrew from the college at the end of the term, returning to Porbandar. As the best-educated of his brothers, Gandhi was seen by his family as the best candidate to one day succeed his father and his uncle Tulsidas as diwan. 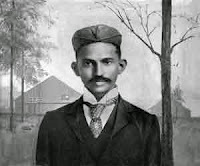 Mavji Dave, a Brahmin priest and family friend, advised Gandhi and his family that he should qualify as a barrister in London, after which he would be certain to achieve the diwanship. Initially, Putlibai did not want her youngest son to leave India and travel across the "black waters", thereby losing his caste. Gandhi's uncle Tulsidas also tried to dissuade his nephew. Finally, Gandhi made a vow to his mother in the presence of a Jain monk to observe the precepts of sexual abstinence as well as abstinence from meat and alcohol, after which Putlibai gave her permission and blessing. In July, Kasturba gave birth to the couple's first surviving son, Harilal. On 10 August, Gandhi left Porbandar for Bombay (Mumbai). Upon arrival in the port, he was met by the head of the Modh Bania community, who had known Gandhi's family. Having learned of Gandhi's plans, he and other elders warned Gandhi that he would be excommunicated if he did not obey their wishes and remain in India. After Gandhi reiterated his intentions to leave for England, the elders declared him an outcast. In London, Gandhi studied law and jurisprudence and enrolled at the Inner Temple with the intention of becoming a barrister. His time in London was influenced by the vow he had made to his mother. Gandhi tried to adopt "English" customs, including taking dancing lessons. However, he could not appreciate the bland vegetarian food offered by his landlady and was frequently hungry until he found one of London's few vegetarian restaurants. Influenced by Henry Salt's writing, he joined the Vegetarian Society, was elected to its executive committee, and started a local Bayswater chapter. Some of the vegetarians he met were members of the Theosophical Society, which had been founded in 1875 to further universal brotherhood, and which was devoted to the study of Buddhist and Hindu literature. They encouraged Gandhi to join them in reading the Bhagavad Gita both in translation as well as in the original. Not having shown interest in religion before, he became interested in religious thought. Gandhi was called to the bar in June 1891 and then left London for India, where he learned that his mother had died while he was in London and that his family had kept the news from him. His attempts at establishing a law practice in Bombay failed because he was psychologically unable to cross-question witnesses. He returned to Rajkot to make a modest living drafting petitions for litigants, but he was forced to stop when he ran foul of a British officer. In 1893, he accepted a year-long contract from Dada Abdulla & Co., an Indian firm, to a post in the Colony of Natal, South Africa, a part of the British Empire. Gandhi was 24 when he arrived in South Africa to work as a legal representative for the Muslim Indian Traders based in the city of Pretoria. He spent 21 years in South Africa, where he developed his political views, ethics and political leadership skills. Indians in South Africa were led by wealthy Muslims, who employed Gandhi as a lawyer, and by impoverished Hindu indentured labourers with very limited rights. Gandhi considered them all to be Indians, taking a lifetime view that "Indianness" transcended religion and caste. He believed he could bridge historic differences, especially regarding religion, and he took that belief back to India where he tried to implement it. The South African experience exposed handicaps to Gandhi that he had not known about. He realised he was out of contact with the enormous complexities of religious and cultural life in India, and believed he understood India by getting to know and leading Indians in South Africa. In South Africa, Gandhi faced the discrimination directed at all coloured people. He was thrown off a train at Pietermaritzburg after refusing to move from the first-class. He protested and was allowed on first class the next day. Travelling farther on by stagecoach, he was beaten by a driver for refusing to move to make room for a European passenger. He suffered other hardships on the journey as well, including being barred from several hotels. In another incident, the magistrate of a Durban court ordered Gandhi to remove his turban, which he refused to do. These events were a turning point in Gandhi's life and shaped his social activism and awakened him to social injustice. After witnessing racism, prejudice and injustice against Indians in South Africa, Gandhi began to question his place in society and his people's standing in the British Empire. Gandhi extended his original period of stay in South Africa to assist Indians in opposing a bill to deny them the right to vote. He asked Joseph Chamberlain, the British Colonial Secretary, to reconsider his position on this bill. Though unable to halt the bill's passage, his campaign was successful in drawing attention to the grievances of Indians in South Africa. He helped found the Natal Indian Congress in 1894, and through this organisation, he moulded the Indian community of South Africa into a unified political force. In January 1897, when Gandhi landed in Durban, a mob of white settlers attacked him and he escaped only through the efforts of the wife of the police superintendent. However, he refused to press charges against any member of the mob, stating it was one of his principles not to seek redress for a personal wrong in a court of law. In 1906, the Transvaal government promulgated a new Act compelling registration of the colony's Indian population. At a mass protest meeting held in Johannesburg on 11 September that year, Gandhi adopted his still evolving methodology of Satyagraha (devotion to the truth), or nonviolent protest, for the first time. He urged Indians to defy the new law and to suffer the punishments for doing so. The community adopted this plan, and during the ensuing seven-year struggle, thousands of Indians were jailed, flogged, or shot for striking, refusing to register, for burning their registration cards or engaging in other forms of nonviolent resistance. The government successfully repressed the Indian protesters, but the public outcry over the harsh treatment of peaceful Indian protesters by the South African government forced South African leader Jan Christiaan Smuts, himself a philosopher, to negotiate a compromise with Gandhi. Gandhi's ideas took shape, and the concept of Satyagraha matured during this struggle. Gandhi focused his attention on Indians while in South Africa and opposed the idea that Indians should be treated at the same level as native Africans while in South Africa. He also stated that he believed "that the white race of South Africa should be the predominating race." 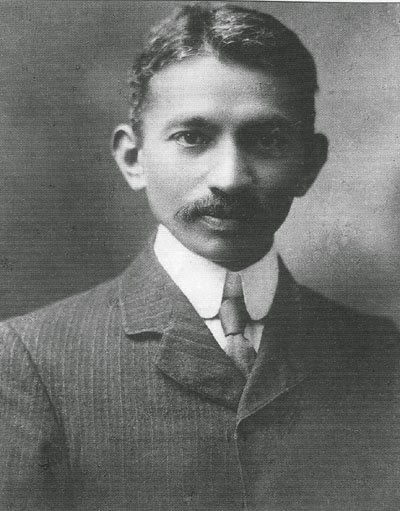 After several treatments he received from Whites in South Africa, Gandhi began to change his thinking and apparently increased his interest in politics. White rule enforced strict segregation among all races and generated conflict between these communities. Bhana and Vahed argue that Gandhi, at first, shared racial notions prevalent of the times and that his experiences in jail sensitised him to the plight of South Africa's indigenous peoples. 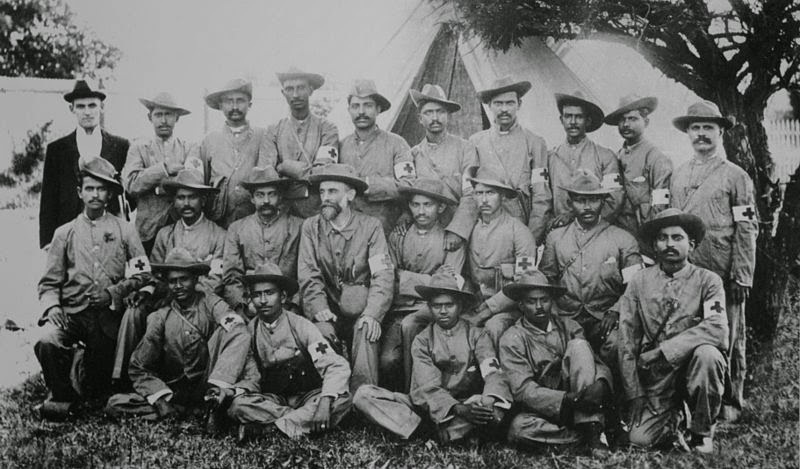 During the Boer War, Gandhi volunteered in 1900 to form a group of ambulance drivers. He wanted to disprove the British idea that Hindus were not fit for "manly" activities involving danger and exertion. Gandhi raised eleven hundred Indian volunteers. They were trained and medically certified to serve on the front lines. At Spion Kop Gandhi and his bearers had to carry wounded soldiers for miles to a field hospital because the terrain was too rough for the ambulances. Gandhi was pleased when someone said that European ambulance corpsmen could not make the trip under the heat without food or water. General Redvers Buller mentioned the courage of the Indians in his dispatch. Gandhi and thirty-seven other Indians received the War Medal. In 1906, when the British declared war against the Zulu Kingdom in Natal, Gandhi encouraged the British to recruit Indians. He argued that Indians should support the war efforts to legitimise their claims to full citizenship. The British accepted Gandhi's offer to let a detachment of 20 Indians volunteer as a stretcher-bearer corps to treat wounded British soldiers. This corps was commanded by Gandhi and operated for less than two months. The experience taught him it was hopeless to directly challenge the overwhelming military power of the British army—he decided it could only be resisted in nonviolent fashion by the pure of heart. In 1910, Gandhi established an idealistic community called 'Tolstoy Farm' near Johannesburg, where he nurtured his policy of peaceful resistance. After blacks gained the right to vote in South Africa, Gandhi was proclaimed a national hero with numerous monuments. At the request of Gokhale, conveyed to him by C.F. Andrews, Gandhi returned to India in 1915. He brought an international reputation as a leading Indian nationalist, theorist and organiser. He joined the Indian National Congress and was introduced to Indian issues, politics and the Indian people primarily by Gopal Krishna Gokhale. Gokhale was a key leader of the Congress Party best known for his restraint and moderation, and his insistence on working inside the system. Gandhi took Gokhale's liberal approach based on British Whiggish traditions and transformed it to make it look wholly Indian. Gandhi took leadership of the Congress in 1920 and began escalating demands until on 26 January 1930 the Indian National Congress declared the independence of India. The British did not recognise the declaration but negotiations ensued, with the Congress taking a role in provincial government in the late 1930s. Gandhi and the Congress withdrew their support of the Raj when the Viceroy declared war on Germany in September 1939 without consultation. Tensions escalated until Gandhi demanded immediate independence in 1942 and the British responded by imprisoning him and tens of thousands of Congress leaders. Meanwhile the Muslim League did co-operate with Britain and moved, against Gandhi's strong opposition, to demands for a totally separate Muslim state of Pakistan. In August 1947 the British partitioned the land with India and Pakistan each achieving independence on terms that Gandhi disapproved. In April 1918, during the latter part of World War I, the Viceroy invited Gandhi to a War Conference in Delhi. Perhaps to show his support for the Empire and help his case for India's independence, Gandhi agreed to actively recruit Indians for the war effort. In contrast to the Zulu War of 1906 and the outbreak of World War I in 1914, when he recruited volunteers for the Ambulance Corps, this time Gandhi attempted to recruit combatants. In a June 1918 leaflet entitled "Appeal for Enlistment", Gandhi wrote "To bring about such a state of things we should have the ability to defend ourselves, that is, the ability to bear arms and to use them...If we want to learn the use of arms with the greatest possible despatch, it is our duty to enlist ourselves in the army." He did, however, stipulate in a letter to the Viceroy's private secretary that he "personally will not kill or injure anybody, friend or foe." Gandhi's war recruitment campaign brought into question his consistency on nonviolence. Gandhi's private secretary noted that "The question of the consistency between his creed of 'Ahimsa' (nonviolence) and his recruiting campaign was raised not only then but has been discussed ever since." Gandhi's first major achievements came in 1918 with the Champaran and Kheda agitations of Bihar and Gujarat. The Champaran agitation pitted the local peasantry against their largely British landlords who were backed by the local administration. The peasantry was forced to grow Indigo, a cash crop whose demand had been declining over two decades, and were forced to sell their crops to the planters at a fixed price. Unhappy with this, the peasantry appealed to Gandhi at his ashram in Ahmedabad. Pursuing a strategy of nonviolent protest, Gandhi took the administration by surprise and won concessions from the authorities. In 1918, Kheda was hit by floods and famine and the peasantry was demanding relief from taxes. Gandhi moved his headquarters to Nadiad, organising scores of supporters and fresh volunteers from the region, the most notable being Vallabhbhai Patel. Using nonco-operation as a technique, Gandhi initiated a signature campaign where peasants pledged non-payment of revenue even under the threat of confiscation of land. A social boycott of mamlatdars and talatdars (revenue officials within the district) accompanied the agitation. Gandhi worked hard to win public support for the agitation across the country. For five months, the administration refused but finally in end-May 1918, the Government gave way on important provisions and relaxed the conditions of payment of revenue tax until the famine ended. In Kheda, Vallabhbhai Patel represented the farmers in negotiations with the British, who suspended revenue collection and released all the prisoners. In 1919, Gandhi, with his weak position in Congress, decided to broaden his political base by increasing his appeal to Muslims. The opportunity came in the form of the Khilafat movement, a worldwide protest by Muslims against the collapsing status of the Caliph, the leader of their religion. The Ottoman Empire had lost the First World War and was dismembered, as Muslims feared for the safety of the holy places and the prestige of their religion. Although Gandhi did not originate the All-India Muslim Conference, which directed the movement in India, he soon became its most prominent spokesman and attracted a strong base of Muslim support with local chapters in all Muslim centres in India. As a mark of solidarity with Indian Muslims he returned the medals that had been bestowed on him by the British government for his work in the Boer and Zulu Wars. He believed that the British government was not being honest in its dealings with Muslims on the Khilafat issue. His success made him India's first national leader with a multicultural base and facilitated his rise to power within Congress, which had previously been unable to influence many Indian Muslims. In 1920 Gandhi became a major leader in Congress. By the end of 1922 the Khilafat movement had collapsed. Gandhi always fought against "communalism", which pitted Muslims against Hindus in Indian politics, but he could not reverse the rapid growth of communalism after 1922. Deadly religious riots broke out in numerous cities, including 91 in Uttar Pradesh alone. At the leadership level, the proportion of Muslims among delegates to Congress fell sharply, from 11% in 1921 to under 4% in 1923. With Congress now behind him in 1920, Gandhi had the base to employ nonco-operation, nonviolence and peaceful resistance as his "weapons" in the struggle against the British Raj. His wide popularity among both Hindus and Muslims made his leadership possible; he even convinced the extreme faction of Muslims to support peaceful nonco-operation. The spark that ignited a national protest was overwhelming anger at the Jallianwala Bagh massacre (or Amritsar massacre) of hundreds of peaceful civilians by British troops in Punjab. Many Britons celebrated the action as needed to prevent another violent uprising similar to the Rebellion of 1857, an attitude that caused many Indian leaders to decide the Raj was controlled by their enemies. Gandhi criticised both the actions of the British Raj and the retaliatory violence of Indians. He authored the resolution offering condolences to British civilian victims and condemning the riots which, after initial opposition in the party, was accepted following Gandhi's emotional speech advocating his principle that all violence was evil and could not be justified. After the massacre and subsequent violence, Gandhi began to focus on winning complete self-government and control of all Indian government institutions, maturing soon into Swaraj or complete individual, spiritual, political independence. During this period, Gandhi claimed to be a "highly orthodox Hindu" and in January 1921 during a speech at a temple in Vadtal, he spoke of the relevance of nonco-operation to Hindu Dharma, "At this holy place, I declare, if you want to protect your 'Hindu Dharma', non-cooperation is first as well as the last lesson you must learn up." In December 1921, Gandhi was invested with executive authority on behalf of the Indian National Congress. Under his leadership, the Congress was reorganised with a new constitution, with the goal of Swaraj. Membership in the party was opened to anyone prepared to pay a token fee. A hierarchy of committees was set up to improve discipline, transforming the party from an elite organisation to one of mass national appeal. Gandhi expanded his nonviolence platform to include the swadeshi policy—the boycott of foreign-made goods, especially British goods. Linked to this was his advocacy that khadi (homespun cloth) be worn by all Indians instead of British-made textiles. 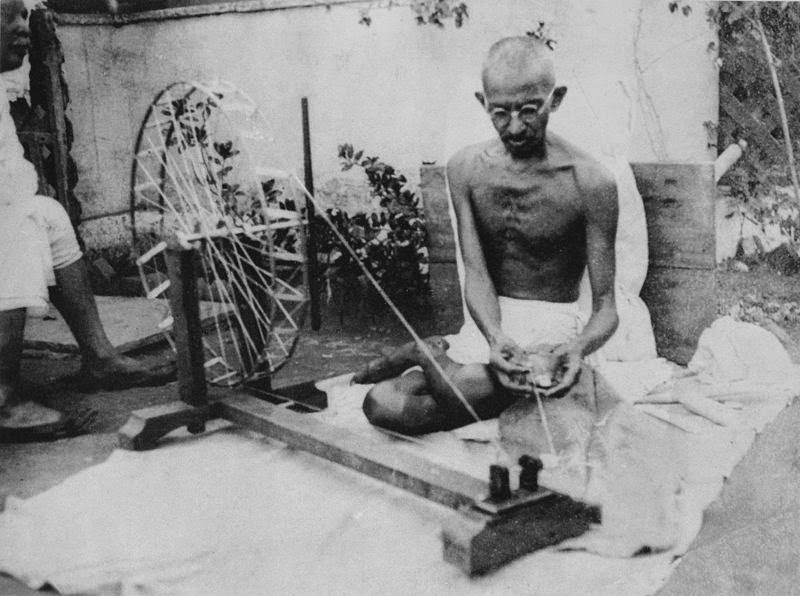 Gandhi exhorted Indian men and women, rich or poor, to spend time each day spinning khadi in support of the independence movement. Gandhi even invented a small, portable spinning wheel that could be folded into the size of a small typewriter. This was a strategy to inculcate discipline and dedication to weeding out the unwilling and ambitious and to include women in the movement at a time when many thought that such activities were not respectable activities for women. In addition to boycotting British products, Gandhi urged the people to boycott British educational institutions and law courts, to resign from government employment, and to forsake British titles and honours. "Non-cooperation" enjoyed widespread appeal and success, increasing excitement and participation from all strata of Indian society. Yet, just as the movement reached its apex, it ended abruptly as a result of a violent clash in the town of Chauri Chaura, Uttar Pradesh, in February 1922. Fearing that the movement was about to take a turn towards violence, and convinced that this would be the undoing of all his work, Gandhi called off the campaign of mass civil disobedience. This was the third time that Gandhi had called off a major campaign. Gandhi was arrested on 10 March 1922, tried for sedition, and sentenced to six years' imprisonment. He began his sentence on 18 March 1922. He was released in February 1924 for an appendicitis operation, having served only two years. 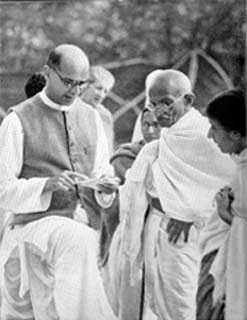 Without Gandhi's unifying personality, the Indian National Congress began to splinter during his years in prison, splitting into two factions, one led by Chitta Ranjan Das and Motilal Nehru favouring party participation in the legislatures, and the other led by Chakravarti Rajagopalachari and Sardar Vallabhbhai Patel, opposing this move. Furthermore, co-operation among Hindus and Muslims, which had been strong at the height of the nonviolence campaign, was breaking down. Gandhi attempted to bridge these differences through many means, including a three-week fast in the autumn of 1924, but with limited success. In this year, Gandhi was persuaded to preside over the Congress session to be held in Belgaum. Gandhi agreed to become president of the session on one condition: that Congressmen should take to wearing homespun khadi. In his long political career, this was the only time when he presided over a Congress session. Gandhi stayed out of active politics and, as such, the limelight for most of the 1920s. He focused instead on resolving the wedge between the Swaraj Party and the Indian National Congress, and expanding initiatives against untouchability, alcoholism, ignorance, and poverty. He returned to the fore in 1928. In the preceding year, the British government had appointed a new constitutional reform commission under Sir John Simon, which did not include any Indian as its member. The result was a boycott of the commission by Indian political parties. Gandhi pushed through a resolution at the Calcutta Congress in December 1928 calling on the British government to grant India dominion status or face a new campaign of nonco-operation with complete independence for the country as its goal. Gandhi had not only moderated the views of younger men like Subhas Chandra Bose and Jawaharlal Nehru, who sought a demand for immediate independence, but also reduced his own call to a one-year wait, instead of two. The British did not respond. On 31 December 1929, the flag of India was unfurled in Lahore. 26 January 1930 was celebrated as India's Independence Day by the Indian National Congress meeting in Lahore. This day was commemorated by almost every other Indian organisation. Gandhi then launched a new Satyagraha against the tax on salt in March 1930. This was highlighted by the famous Salt March to Dandi from 12 March to 6 April, where he marched 388 kilometres (241 mi) from Ahmedabad to Dandi, Gujarat to make salt himself. Thousands of Indians joined him on this march to the sea. This campaign was one of his most successful at upsetting British hold on India; Britain responded by imprisoning over 60,000 people. Gandhi strongly favoured the emancipation of women, and he went so far as to say that "the women have come to look upon me as one of themselves." He opposed purdah, child marriage, untouchability, and the extreme oppression of Hindu widows, up to and including sati. He especially recruited women to participate in the salt tax campaigns and the boycott of foreign products. Sarma concludes that Gandhi's success in enlisting women in his campaigns, including the salt tax campaign, the anti-untouchability campaign and the peasant movement, gave many women a new self-confidence and dignity in the mainstream of Indian public life. Congress in the 1920s appealed to peasants by portraying Gandhi as a sort of messiah, a strategy that succeeded in incorporating radical forces within the peasantry into the nonviolent resistance movement. In thousands of villages plays were performed that presented Gandhi as the reincarnation of earlier Indian nationalist leaders, or even as a demigod. The plays built support among illiterate peasants steeped in traditional Hindu culture. Similar messianic imagery appeared in popular songs and poems, and in Congress-sponsored religious pageants and celebrations. The result was that Gandhi became not only a folk hero but the Congress was widely seen in the villages as his sacred instrument. The government, represented by Lord Edward Irwin, decided to negotiate with Gandhi. The Gandhi–Irwin Pact was signed in March 1931. The British Government agreed to free all political prisoners, in return for the suspension of the civil disobedience movement. Also as a result of the pact, Gandhi was invited to attend the Round Table Conference in London as the sole representative of the Indian National Congress. The conference was a disappointment to Gandhi and the nationalists, because it focused on the Indian princes and Indian minorities rather than on a transfer of power. Lord Irwin's successor, Lord Willingdon, taking a hard line against nationalism, began a new campaign of controlling and subduing the nationalist movement. Gandhi was again arrested, and the government tried and failed to negate his influence by completely isolating him from his followers. On 8 May 1933, Gandhi began a 21-day fast of self-purification and launched a one-year campaign to help the Harijan movement. This new campaign was not universally embraced within the Dalit community, as Ambedkar condemned Gandhi's use of the term Harijans as saying that Dalits were socially immature, and that privileged caste Indians played a paternalistic role. Ambedkar and his allies also felt Gandhi was undermining Dalit political rights. Gandhi had also refused to support the untouchables in 1924–25 when they were campaigning for the right to pray in temples. Because of Gandhi's actions, Ambedkar described him as "devious and untrustworthy". Gandhi, although born into the Vaishya caste, insisted that he was able to speak on behalf of Dalits, despite the presence of Dalit activists such as Ambedkar. Gandhi and Ambedkar often clashed because Ambedkar sought to remove the Dalits out of the Hindu community, while Gandhi tried to save Hinduism by exorcising untouchability. Ambedkar complained that Gandhi moved too slowly, while Hindu traditionalists said Gandhi was a dangerous radical who rejected scripture. Guha noted in 2012 that, "Ideologues have carried these old rivalries into the present, with the demonization of Gandhi now common among politicians who presume to speak in Ambedkar's name." In 1934 Gandhi resigned from Congress party membership. He did not disagree with the party's position but felt that if he resigned, his popularity with Indians would cease to stifle the party's membership, which actually varied, including communists, socialists, trade unionists, students, religious conservatives, and those with pro-business convictions, and that these various voices would get a chance to make themselves heard. Gandhi also wanted to avoid being a target for Raj propaganda by leading a party that had temporarily accepted political accommodation with the Raj. Gandhi returned to active politics again in 1936, with the Nehru presidency and the Lucknow session of the Congress. Although Gandhi wanted a total focus on the task of winning independence and not speculation about India's future, he did not restrain the Congress from adopting socialism as its goal. Gandhi had a clash with Subhas Chandra Bose, who had been elected president in 1938, and who had previously expressed a lack of faith in nonviolence as a means of protest. Despite Gandhi's opposition, Bose won a second term as Congress President, against Gandhi's nominee, Dr. Pattabhi Sitaramayya; but left the Congress when the All-India leaders resigned en masse in protest of his abandonment of the principles introduced by Gandhi. Gandhi declared that Sitaramayya's defeat was his defeat. Gandhi initially favoured offering "nonviolent moral support" to the British effort when World War II broke out in 1939, but the Congressional leaders were offended by the unilateral inclusion of India in the war without consultation of the people's representatives. All Congressmen resigned from office. After long deliberations, Gandhi declared that India could not be party to a war ostensibly being fought for democratic freedom while that freedom was denied to India itself. As the war progressed, Gandhi intensified his demand for independence, calling for the British to Quit India in a speech at Gowalia Tank Maidan. This was Gandhi's and the Congress Party's most definitive revolt aimed at securing the British exit from India. Gandhi was criticised by some Congress party members and other Indian political groups, both pro-British and anti-British. Some felt that not supporting Britain more in its struggle against Nazi Germany was unethical. Others felt that Gandhi's refusal for India to participate in the war was insufficient and more direct opposition should be taken, while Britain fought against Nazism, it continued to refuse to grant India Independence. Quit India became the most forceful movement in the history of the struggle, with mass arrests and violence on an unprecedented scale. In 1942, although still committed in his efforts to "launch a nonviolent movement", Gandhi clarified that the movement would not be stopped by individual acts of violence, saying that the "ordered anarchy" of "the present system of administration" was "worse than real anarchy." He called on all Congressmen and Indians to maintain discipline via ahimsa, and Karo ya maro ("Do or die") in the cause of ultimate freedom. Gandhi and the entire Congress Working Committee were arrested in Bombay by the British on 9 August 1942. Gandhi was held for two years in the Aga Khan Palace in Pune. It was here that Gandhi suffered two terrible blows in his personal life. His 50-year-old secretary Mahadev Desai died of a heart attack 6 days later and his wife Kasturba died after 18 months' imprisonment on 22 February 1944; six weeks later Gandhi suffered a severe malaria attack. He was released before the end of the war on 6 May 1944 because of his failing health and necessary surgery; the Raj did not want him to die in prison and enrage the nation. He came out of detention to an altered political scene—the Muslim League for example, which a few years earlier had appeared marginal, "now occupied the centre of the political stage" and the topic of Muhammad Ali Jinnah's campaign for Pakistan was a major talking point. 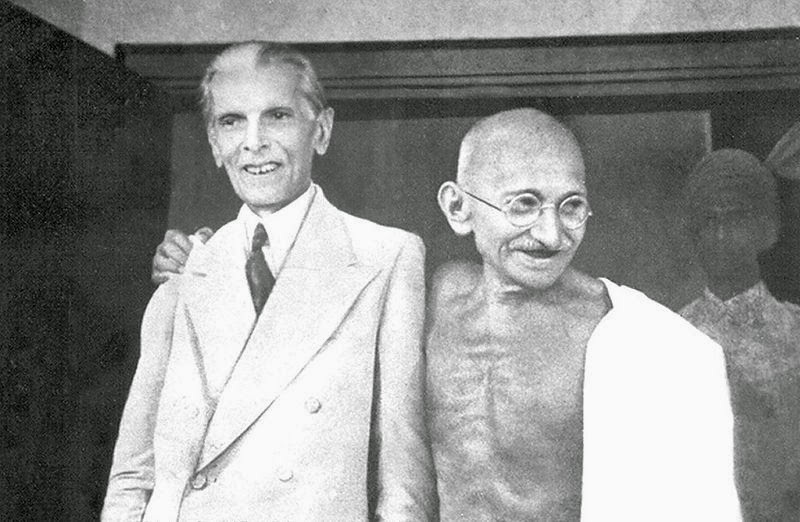 Gandhi met Jinnah in September 1944 in Bombay but Jinnah rejected, on the grounds that it fell short of a fully independent Pakistan, his proposal of the right of Muslim provinces to opt out of substantial parts of the forthcoming political union. While the leaders of Congress languished in jail, the other parties supported the war and gained organizational strength. Underground publications flailed at the ruthless suppression of Congress, but it had little control over events. At the end of the war, the British gave clear indications that power would be transferred to Indian hands. At this point Gandhi called off the struggle, and around 100,000 political prisoners were released, including the Congress's leadership. As a rule, Gandhi was opposed to the concept of partition as it contradicted his vision of religious unity. Concerning the partition of India to create Pakistan, while the Indian National Congress and Gandhi called for the British to quit India, the Muslim League passed a resolution for them to divide and quit, in 1943. 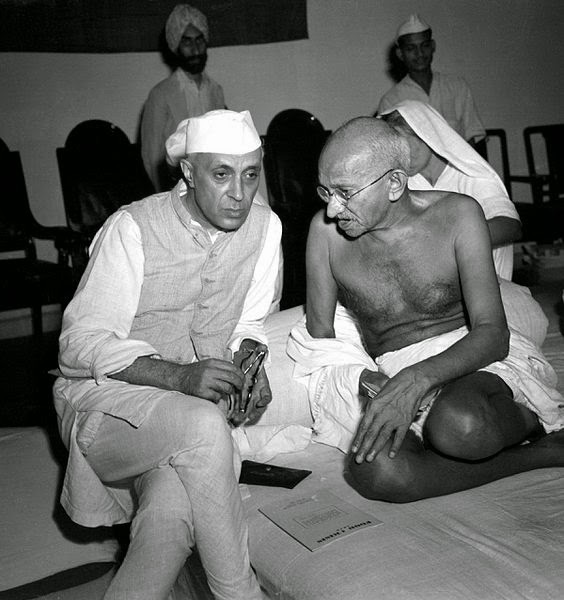 Gandhi suggested an agreement which required the Congress and Muslim League to co-operate and attain independence under a provisional government, thereafter, the question of partition could be resolved by a plebiscite in the districts with a Muslim majority. When Jinnah called for Direct Action, on 16 August 1946, Gandhi was infuriated and personally visited the most riot-prone areas to stop the massacres. He made strong efforts to unite the Indian Hindus, Muslims, and Christians and struggled for the emancipation of the "untouchables" in Hindu society. India's partition and independence were accompanied by more than half a million killed in riots as 10–12 million Hindus, Sikhs and Muslims crossed the borders dividing India and Pakistan. Gandhi, having vowed to spend the day of independence fasting and spinning, was in Calcutta on August 15, 1947 where he prayed, confronted rioters and worked with Huseyn Shaheed Suhrawardy to stop the communal killing. But for his teachings, the efforts of his followers, and his own presence, there perhaps could have been much more bloodshed during the partition, according to prominent Norwegian historian, Jens Arup Seip. Stanley Wolpert has argued, the "plan to carve up British India was never approved of or accepted by Gandhi...who realised too late that his closest comrades and disciples were more interested in power than principle, and that his own vision had long been clouded by the illusion that the struggle he led for India's independence was a nonviolent one." Gandhi's death was mourned nationwide. Over two million people joined the five-mile long funeral procession that took over five hours to reach Raj Ghat from Birla house, where he was assassinated. Gandhi's body was transported on a weapons carrier, whose chassis was dismantled overnight to allow a high-floor to be installed so that people could catch a glimpse of his body. The engine of the vehicle was not used, instead four drag-ropes manned by 50 people each pulled the vehicle. All Indian-owned establishments in London remained closed in mourning as thousands of people from all faiths and denominations and Indians from all over Britain converged at India House in London. While India mourned and communal (inter-religious) violence escalated, there were calls for retaliation, and even an invasion of Pakistan by the Indian army. Nehru and Patel, the two strongest figures in the government and in Congress, had been pulling in opposite directions; the assassination pushed them together. They agreed the first objective must be to calm the hysteria. They called on Indians to honour Gandhi's memory and even more his ideals. They used the assassination to consolidate the authority of the new Indian state. The government made sure everyone knew the guilty party was not a Muslim. Congress tightly controlled the epic public displays of grief over a two-week period—the funeral, mortuary rituals and distribution of the martyr's ashes—as millions participated and hundreds of millions watched. The goal was to assert the power of the government and legitimise the Congress Party's control. This move built upon the massive outpouring of Hindu expressions of grief. The government suppressed the RSS, the Muslim National Guards, and the Khaksars, with some 200,000 arrests. Gandhi's death and funeral linked the distant state with the Indian people and made more understand why religious parties were being suppressed during the transition to independence for the Indian people. By Hindu tradition the ashes were to be spread on a river. Gandhi's ashes were poured into urns which were sent across India for memorial services. Most were immersed at the Sangam at Allahabad on 12 February 1948, but some were secretly taken away. In 1997, Tushar Gandhi immersed the contents of one urn, found in a bank vault and reclaimed through the courts, at the Sangam at Allahabad. Some of Gandhi's ashes were scattered at the source of the Nile River near Jinja, Uganda, and a memorial plaque marks the event. On 30 January 2008, the contents of another urn were immersed at Girgaum Chowpatty. Another urn is at the palace of the Aga Khan in Pune (where Gandhi had been imprisoned from 1942 to 1944) and another in the Self-Realization Fellowship Lake Shrine in Los Angeles.